Inspired by the homemade mayonnaise I made yesterday I decided to create a primal dressing for one of the many salads I will be eating over the next several days (see my post on my CSA farm share. I got the idea for the flavors in this salad one especially frantic afternoon a few weeks ago. I rushed into Whole Foods hoping to find a quick bite before my night class. I ended up with a delicious curry tofu salad. Unfortunately I am pretty sure it had loads of sugar in it. I added a small amount of agave nectar to the dressing here but if you want to make this 100% primal, it would be good without, too. I frequently just defrost a few shrimp at a time to top a salad or go with some other vegetable dish. However, other sources of protein, such as chicken, steak, or pork tenderloin would go wonderfully with this salad as well, and might be less trouble depending on what you have on hand. Assemble the salad in a large bowl. Assemble the dressing and combine with the salad. Divide the salad among two large plates. Mix the shrimp with the salt, pepper and sugar in a bowl. Heat the coconut oil on medium-high heat until very hot. Add the shrimp and cook for approximately 4 minutes, turning half way. 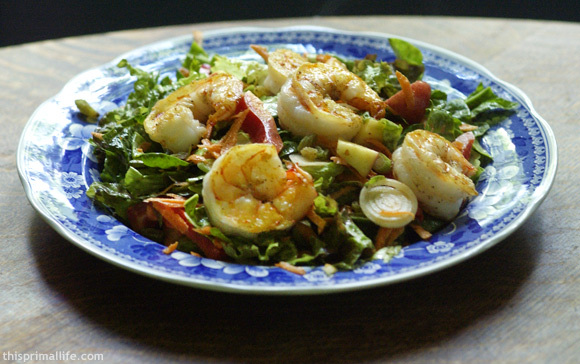 Top salad with cooked shrimp. Thank you, very useful. I wasnt really a big fan of Spinach for many years (ok, that’s a total lie, I hated the stuff), but after marrying a vegetarian I kind of had to get used to it, and have slowly come to absolutely love the stuff. Spinach curry is undoubtedly my absolute favourite! I recently found an entire spinach recipes website which is my new favourite site now, you should take a look!